Access to information is very important and radio, while an old technology now, is likely to be one of the best sources of information during a crisis. AM radio is a particularly good source because of its range and likelihood of operation. the DEGEN DE13 world receiver. DEGEN DE13 Solar / windup/ 5V DC powered. 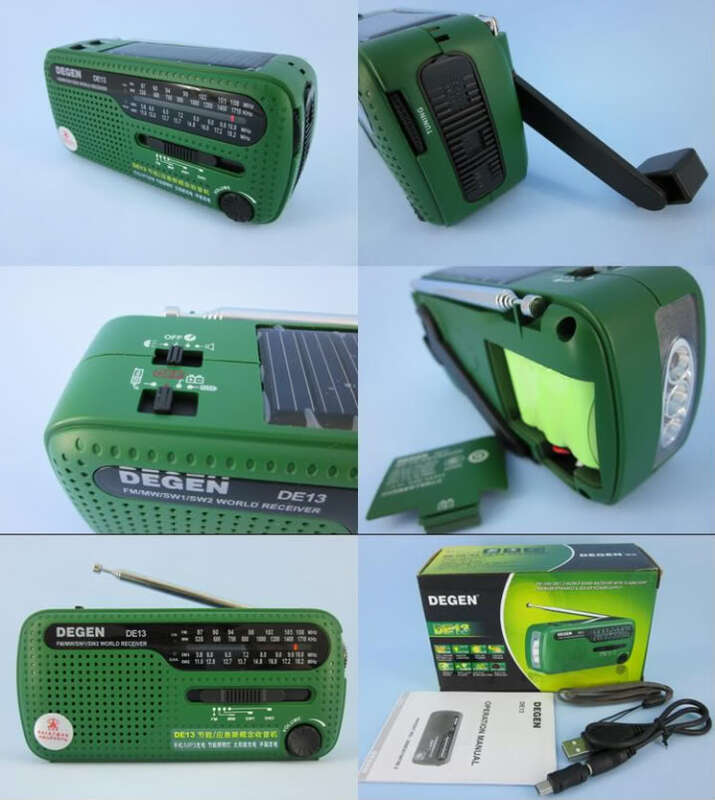 Radio AM FM SW, LED flash light, red flashing LED, USB power output, and alarm. This is a really great radio, packed with features. A radio? You may think that because your mobile phone has a radio you’ve got it covered. Well partially. Mobile phones generally only receive FM radio and usually only with headphones attached as they double as the antenna. FM is a relatively short range radio signal so if you are far from a transmitter you wont hear anything. AM radio stations use large amounts of power and have large capacitors in order to operate, so that when the power goes off to radio stations FM stations only have generator reserves. AM stations will have a few days of electric reserves in their capacitors on top of generator reserves, so an AM receiver will be more likely to give you information and for longer. AM stations also have much longer range in reception as well. Shortwave SW radio has enormous range, you’ll realize this when you start hearing languages other than English on them. Shortwave radio receivers are somewhat uncommon these day also. Solar: A nice little polycrystalline panel. Wind up: 60 turns of the handle for 1 hour of radio. AAA cells: 3 AAA cells are an option. micro USB port: the 5 pin connector, connect to a computer or other 5V DC source. Lithium battery: Just like what is in cordless phones. 3 LED light, a pretty good light for shorter range illumination. Red flashing LED, this is meant to be for reading maps at night, the red doesn’t affect you night vision too much. Siren: I’m not sure how this is useful but its there. USB output: I think this runs from the wind up only, and has output limited to low current for charging older mobile phones or small electronic devices, but better than nothing (though the manual doesn’t specify). Not waterproof, this can be mitigated buy using a small water proof container or bag. Not dust proof, if your operating environment is very dusty of silty you could have trouble. Antenna clasp is a bit fragile, fortunately this is not a critical component. Battery case cover for the 3xAAA compartment seems a little flimsy. No clock, one of the few products where the addition of a clock might have made sense, radio shows are scheduled to start at certain times, thought announcers do tend to quote the time often enough. The instruction manual that comes with this device is pretty vaguely written, a bad translation from Chinese, it’s almost a throw away manual. 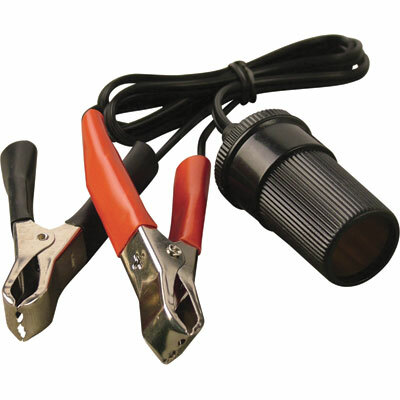 There is not form of charge indicator, just charging LED (green) and a discharging LED (red). Short wave radio stations sometimes talk about transmitting on X meters rather than a frequency. c is the speed of light in a vacuum 299 792 458 m / s , you’ll notice this number is close to 300,000,000, 300 million or 3 x 10 ^8. Frequency: f , measured in Hz (Hertz). This radio can detect that short wave frequency and those between 5.8 MHz and 18.2 MHz (51 to 16.5 meters in wavelength). It should be noted that some SW bands are not in the frequency region where they should be due to some historical conventions. You should create a series of notebook entries listing for each location you plan to be in which frequencies are operational and what type of information is given. A great deal of information can be inferred from which stations are still broadcasting also with what information they are giving. Can be bought from many internet sellers for about $30. Posted in 5 Volt, Collapse scenario, Communication, Human powered, Scram Bag, Solar PV, Sudden crisis. 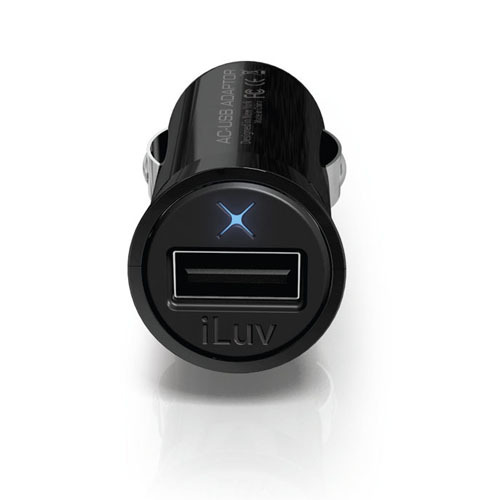 If you need USB power and you have access to a car or a car cigarette lighter plug that has power, this is precisely what you need. I really liked how this example appears to be thumbing its nose at copyrights of Apple and Microsoft XboX. Some models are tolerant of input voltages from 12-24 volts some are not. Some models advertise what level of current they supply, 1 Amp is common. these devices only supply power to the USB device not data, this device will not allow you to ‘download a car’ or some other wizardry. Cost: about $10 for electronics and car accessory shops. Cheaper models may be available with lower output current.